During the year of writing my two novels, My Own Voice and The White Piano, I discovered several ways of advancing the story. It originated from a short story about a twelve years old boy coming face to face, for the first time in his life, with the spectacle of death in the family. I set it aside, thinking I was done with it. But this character, Ben, came back to me and started chatting, chatting, chatting incessantly in my head. So I asked myself, what if I ‘aged’ him by fifteen years? Where would he be then? Would he still admire his father as a hero—or will he be disillusioned at that point? What secrets would come to light in the life of this family? How would it feel for Ben to come back to his childhood home, and have his memories play tricks on him? What if I introduce a girl, Anita, a redhead who looks as beautiful as his mother used to be—but is extremely different from her in all other respects? And what if this girl were married to his father? What if the father were an author, attempting to capture the thoughts, the voices of Ben and Anita, in order to write his book? So, to slow down the chatter I would throw some obstacle in my characters’ way, and let them ponder how to find their way around it. This, I found, was such a fun method of developing the story, and it allowed the plot to twist and turn in unexpected ways. One of these obstacles was the unravelling of a family secret. 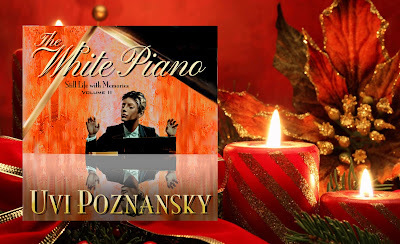 Upon coming back to his childhood home he discovers that his mother, Natasha, the renowned pianist, is suffering from early-onset Alzheimer's. He undergoes a complete transition from denial to utter shock as her condition deteriorates. And I wait there on my knees for a long while, and change my position to a squat, hoping that eventually, she will come up with something to say, because she did so that last time. And I wish that in her heart, she is as exhilarated as I am at this moment, because that can easily explain why she is sitting there, speechless. I never prayed before, so now—while trying to balance the combined weight of my body and of the album—I am looking for words, the right words to call on Luck, or Fate, whatever: Please, give me a sign. If my mother can catch sight of me, if only she can laugh, I think all will be well. “Here I am, mom,” I press on. What was I thinking, I ask myself. Of course it will take some time before she turns to look at me, before she smiles, even, and takes me into her arms, to make me feel warm again. Years, years have passed since mom heard my voice. To her this moment feels, perhaps, as if it came from another lifetime. Still, I must trust that she will, somehow, find a way to forgive me, forgive my long absence; which is not an easy thing to do, for a woman as proud as she is—I mean, as she used to be. Her character was not an easy one to develop. The primary problem is that she has no voice. She is utterly silent, which makes her son hope—at first—that she can be reached, that he can 'save' her. And now, just as the novel has sprung out of a short story, a series is about to spring out of the novel. In my mind, a series comes to life only what the characters linger, when they have a voice that demands listening. "What is there to say? she moves my heart as I feel with the story of passion, love, pain, regrets and sorrow."